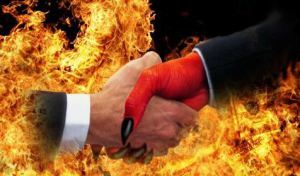 Tea Parties Made A Deal With The Devil | Stop Obama Now!! The Tea Party has often been hailed by conservatives as the savior of the Nation, but they and many other such patriot groups have struck a deal with the “Devil” (aka Big Government) when they sought a non-profit tax status that puts them on a leash held by Obama, himself, and severely limits their engagement in politics, prohibiting them from confronting the Great Deceiver directly. This selling of the patriot soul for a handful of tax benefits threatens to condemn the constitutional republic straight to hell.